Our employees are at the heart of our organisation, and their health and safety is our top priority. Beyond this, we prioritise their development and well-being and seek to promote equality and diversity at every level of our organisation. Retained ISO 14001 certification at Letšeng and received ISO 45001 certification for the first time. The challenge of mining a remote site at altitude in severe weather conditions requires a consistent focus on aspects of employee health, safety and well-being. Our current Business Transformation (BT) process involves cost reductions and rationalisation. During the ongoing transformation process, all changes and cost reductions have been thoroughly scrutinised to ensure that the safety of our staff and the sustainability of the business are not compromised in any way. In preparation for the sale of the Ghaghoo mine, we are cognisant of the impact the transaction will have on the remaining employees at the mine. We remain committed to ensuring our employees are treated fairly and continue to prioritise issues that promote safety, health and well-being. We will continue to develop and retain the right people to deliver on our organisational objectives and to achieve exceptional results. Mining is an inherently high-risk industry. Given that our Letšeng mine is one of the highest and most remote diamond mines in the world, we face unique operational challenges that require specialised knowledge, rigorous planning and exceptional leadership to embed a culture of zero harm. We believe that all accidents are preventable and that any injury or loss of life is unacceptable. We continually work to eliminate known hazards and monitor and manage potential risks within the workplace. We use an integrated management approach to assess the risks our operations might pose to the occupational health and safety of our employees. Our stringent management processes, along with purposefully designed training and induction procedures, ensure that employees are made aware of and comply with the highest safety standards. Furthermore, as part of our risk assessment process, we regularly engage with our employees on the risks they face and implement systems that reduce their exposure to hazards. When monitoring safety on-site, we distinguish between LTIs and restricted work injuries (RWIs). An LTI occurs when the injury prevents the execution of the injured person's regular duties, as well as light duties for at least one full day. An RWI occurs when the injury prevents the execution of the injured person's regular duties for at least one full day, although they are still able to execute light duties associated with their regular duties. Behaviour-based care (BBC) forms the cornerstone of our management approach. The initiative goes beyond a focus on workplace safety, seeking to instil a culture of intentional care for employees and the environment. During the year, the BBC initiative continued to be embedded in our operations. We have comprehensive grievance procedures in place and make use of a whistleblowing facility at the Letšeng mine to encourage anonymous reporting of issues or incidences. Four LTIs occurred across the Group during 2018, resulting in a Group-wide lost time injury frequency rate (LTIFR) of 0.15. Lowest all injury frequency rate (AIFR) ever recorded of 1.45. Four RWIs occurred across the Group during 2018 (2017: eight), resulting in a restricted work injury frequency rate (RWIFR) of 0.15 (2017: 0.29). Across every industry, the relationship between quality talent and business performance is clear. Furthermore, the growing skills shortage in the global natural resource sector increases the importance of retaining high-calibre employees. We attract and retain talented, passionate people by offering market-related salaries, supportive working environments and meaningful development experiences. We seek to engage with our employees on an ongoing basis in our endeavour to create a collaborative working environment that facilitates the development and retention of our people. Furthermore, community projects and contributions provide a differentiating factor for us as an employer, demonstrating a higher purpose to our employees that goes beyond the finite resource we mine, to our stated aim of creating a positive legacy for all our stakeholders. We recognise that remuneration plays a significant role in the attraction and retention of quality individuals. 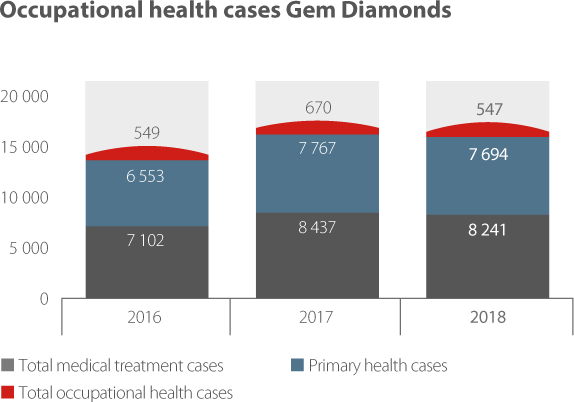 Gem Diamonds remunerates all employees in line with market-related rates, with male and female employees in the same occupational grade rewarded at the same level. Furthermore, we endeavour to ensure that our lowest-graded employees are remunerated above the minimum wage standards of the host country. While Lesotho and Botswana do not prescribe a minimum wage in the mining sector, we use the construction industry wage guidelines as the standard. The shift in the composition of our workforce is reflective of the change in projects over the LOM. During 2017, projects carried out on-site required a high degree of skilled and professional labour, while projects carried our during this year necessitated a larger proportion of unskilled or semi-skilled labour. This is reflected in the compensation profile of the operation. In total, 8.6% of the workforce at Letšeng were compensated at the operation’s minimum wage (2017: 0.2%). In 2018, the lowest-graded permanent employees at our Letšeng mine were remunerated at 54% above the construction sector’s minimum wage (2017: 212%). 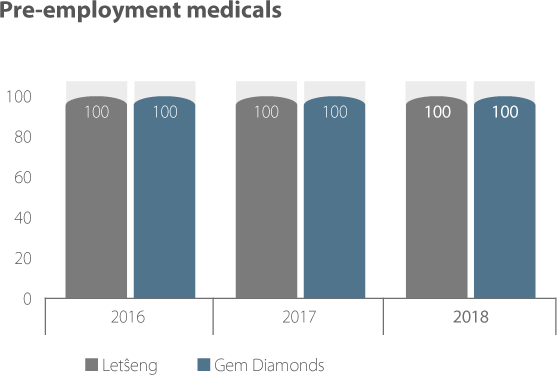 The remainder of Gem Diamonds’ workforce is remunerated above the minimum wage, in line with market-related rates. We ensure that minimum requirements regarding remuneration are contractually stipulated with all our major labour contractors. To drive attraction and retention of top talent, we provide benefits and incentives over and above basic remuneration. 100% of Basotho nationals employed at Letšeng are subscribed to the mandatory government retirement provision scheme, and Letšeng contributes 7.5% of the annual salary per employee to this scheme, while the employee also contributes 7.5%. Employees at Ghaghoo receive a gratuity payment upon completion of their contract, which is equal to 15% of their basic monthly salary for each month of employment. Employees at our Belgian operations contribute 32% of their salary to a mandatory government retirement scheme (2017: 32%). All other operations and offices remunerate employees on a cost-to-company basis, and employees are free to elect their retirement schemes and contributions. We manage our employee ageing appropriately through continued monitoring of our workforce’s average age. Given the remote locations of our mine, every care is taken to ensure the well-being and comfort of our employees during their shift rotations. Letšeng operates continuously, and while our shift configurations are determined by local legislative requirements, as well as operational and market demands, we make every effort to minimise disruptions to normal social structures as far as possible. 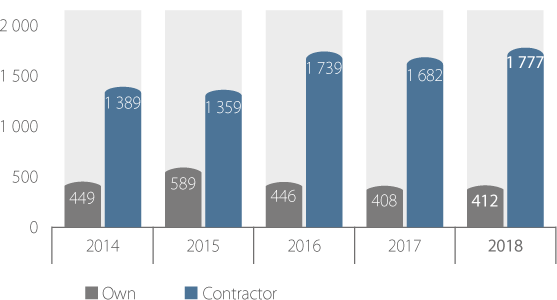 401 employees (2017: 412) and 1740 contractor employees (2017: 1 581) at year end. The average number of employees was 412 (2017: 408), and the average number of contractor employees was 1777 (2017: 1682). US$36.1 million was spent on employee wages, benefits and incentives (2017: US$36.3). Group-wide absenteeism rate was 1.6 days per person (2017: 2.1 days). 8.7% Group-wide voluntary staff turnover (2017: 8.7%). Zero cases of discrimination were recorded in 2018 (2017: Zero). 20% of our workforce consisted of female employees (2017: 19%). 0% of our Gem Diamonds’ Board members were female (2017: 0%). 11% of the Group’s senior management were female (2017: 8%). To remain competitive, we require exceptional people. While we invest in recruiting specialist skills as required, we also empower Gem Diamond employees to further their careers by providing learning and development opportunities. We invest in the training and development of our employees both professionally and personally. While our subsidiaries have not yet implemented programmes for skills management or lifelong learning, we offer training through various internal and external programmes, as well as through our well-established mentorship culture. In addition, we perform annual career reviews at strategic levels across the Group to ensure that key personnel are engaged and developed to meet business requirements. Senior management: 614 hours (2017: 379). Middle management: 2 474 hours (2017: 457). Non-management: 15 145 hours (2017: 15 989). 28% of employee career reviews performed (2017: 26%). 60% of female employees received reviews (2017: 72%). 20% of male employees received reviews (2017: 20%). The remote location of our mines necessitates a reliance on the on-site clinics and medical stations at our operations to provide emergency, occupational and primary healthcare to our employees. We are committed to providing an environment that actively promotes and supports our employees’ health and well-being. Our on-site clinics and medical stations are staffed by medical practitioners as well as paramedics. In addition to reactive medical treatment, we believe in a proactive approach to employee health management. We commit to providing an environment that prevents unhealthy situations and actively promotes and supports employee well-being and healthy living. During the induction programme for all new employees, we facilitate a complete medical examination to proactively promote their care and well-being. Additionally, when an employee leaves our operations, we perform exit medical examinations. Ghaghoo clinic offers primary healthcare, with backup medical emergency services provided through a third-party supplier. 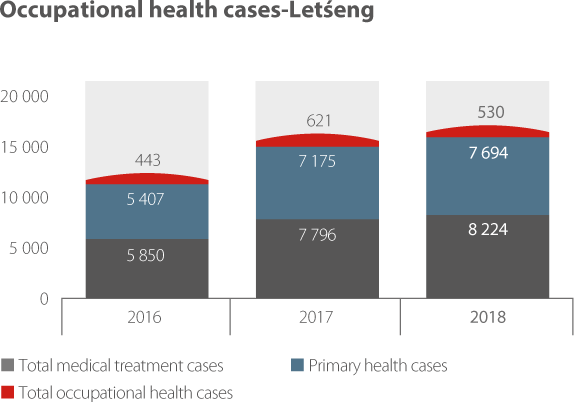 100% pre-employment medical examination rate at Letšeng (2017: 100%). 100% exit-medical examination rate at Letšeng (2017: 100%). Decrease in the number of occupational health cases to 530 (2017: 621). 8 611 serious disease prevention and management interventions (2017: 6 464). We seek to maintain and consistently improve employee engagement to enhance our employee relations. During 2018, our Letšeng operation remained non-unionised, while Ghaghoo became unionised in 2016. By engaging with elected representatives, we aim to be proactive in addressing employee grievances. Moreover, we maintain a policy of freedom of association and our employees are free to join unions and other collective bargaining organisations. We are satisfied that adequate mechanisms are in place to record and address employees’ grievances, and we maintain good relationships with our employees and relevant bodies. Zero strikes or lockouts were recorded in 2018. Constructive engagement with employee representatives continued in 2018. A second organisational health index survey was conducted during 2018 demonstrating that the initiatives implemented, following the first organisational health survey in 2017, successfully addressed the priority areas (see case study).